Operatives of the Federal Special Anti-robbery Squad, FSARS at Adeniji Adele, Lagos Island, Lagos have arrested a fleeing robbery suspect who allegedly connived with an accomplice now at large to rob and kill a Taxify (Bolt) driver before absconding with the victim's Toyota Camry Car. According to PM Express, the suspect, Ikechukwu Ozorumba, 29, and a native of Obolo Uku, Delta State but resident of 16, Yaro Street, Okokomaiko, a suburb of Lagos, allegedly conspired with his friend simply called Nkelechi, aka Sunshine to rob the driver, Ebenezer Olotu, a native of Akoko in Ondo State of his Toyota Camry Car with number plate, SMK 980 FM at Okokomaiko area of Lagos and allegedly kill him and drove the car to Imo State to look for a buyer for it. Police also arrested alongside the suspect one Chima Chukwuemeka, 38, a palm oil farmer in Oguta, Imo State for allegedly harboring the robbery suspect in his farm to evade Police arrest. Nemesis caught up with the robbery suspect when the family of the late driver petitioned the Deputy Commissioner of Police, DCP in charge of FSARS, Lagos, Mr. Kola Kamaldeen that their breadwinner who worked as a Taxify (Bolt) driver in Lagos left home for work on 26 December, 2018 and had yet to return home since. Following the report, Kamaldeen directed his crack team led by SP Olaniyi Festus to do everything to locate the missing driver. A Police source alleged that after days of intelligence gathering in Lagos metropolis, the Police team following a tip off found the corpse of the late driver dumped at Jimoh Street, Okokomaiko, Ojo, Lagos. The source further alleged that the Police team later tracked the robbery suspect through the phone number of the victim to Imo State where they arrested the oil farmer who led the Police to his farm in Oguta, where the suspect was arrested. 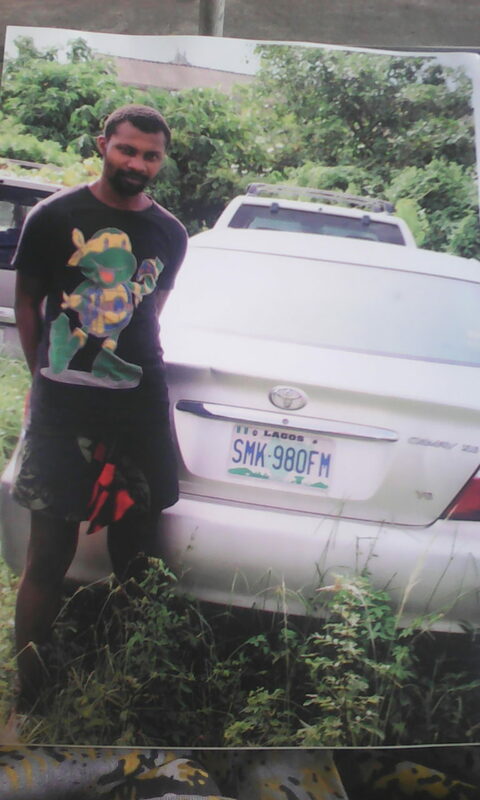 The suspect then led the Police to recover the stolen Car at a hideout in Imo State and they brought the two suspects and the recovered car to FSARS office in Lagos. During investigation, the robbery suspect allegedly confessed to the crime and said he and his accomplice, Nkelechi now on the run did not intend to kill the driver, but just to rob him of his car and that the driver’s stubbornness led to his death. In his alleged confessions to the Police, Ikechukwu allegedly stated: “On 26 December, 2018, we chartered the driver as passengers in Surulere area of Lagos and told him to take us to Okolomaiko area of Lagos. In his own narrations, Chukwuemeka allegedly stated that if he had known that Ikechukwu robbed a driver of his car and killed him, he would not have harbored him in his farm till the Police came from Lagos to arrest him over matter he knew nothing about. A Police source said that the suspects would be charged to Court after completion of investigations. Where is that Godforsaken Igbo maniac, ugly-skunk77? Comment on what your fellow fools have done. Cursed humans from cursed tribe! Whoever kills should be killed..whoever kills should be killed. Why calling your fellow man a fool?you are tribalistic and people like you should be wiped off from this country, look at the trash coming out from your mouth, that this man is evil,does it mean all ibos are like him? Pls give your life to christ and stop the hate! I quite appreciate your concern, but don't you think it's rather rude to attend a party you're not invited to? Another thing I perfectly detest about them, so blinded by tribe that they can't speak the truth even when they're obviously wrong. Hopeless wall gecko! Okoro-nnmadu! Wetin you say chop your papa brain? Animal! Who gave birth to such a fool?...must be a wh*re! GBAM. Lol. Nnamdi kanu's puppet, you finally mustered the courage support your brother. I'm impressed... If only you knew how many Nigeria soldiers brutally raped your mother during the civil war I'm sure you won't be spewing out this rubbish... Imagine, a hopeless Osu like you trying to be relevant. Son of a b*tch!